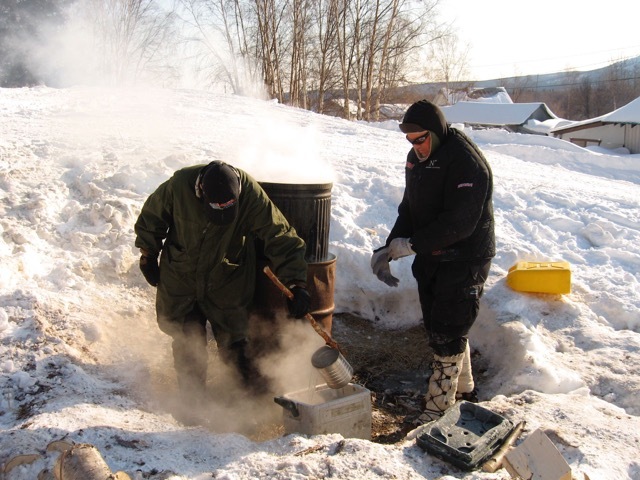 Ken Anderson getting hot water from the cooker in Takotna. Tomorrow will be a scorching 35° outside! How often have you heard a meteorologist utter these words? 35° can sound scorching if you’re from Norway or Sweden, but here in the United States it is actually quite chilly. 35° Celsius is approximately 95° Fahrenheit. The United States still measures temperature in Fahrenheit while many other countries are using Celsius. 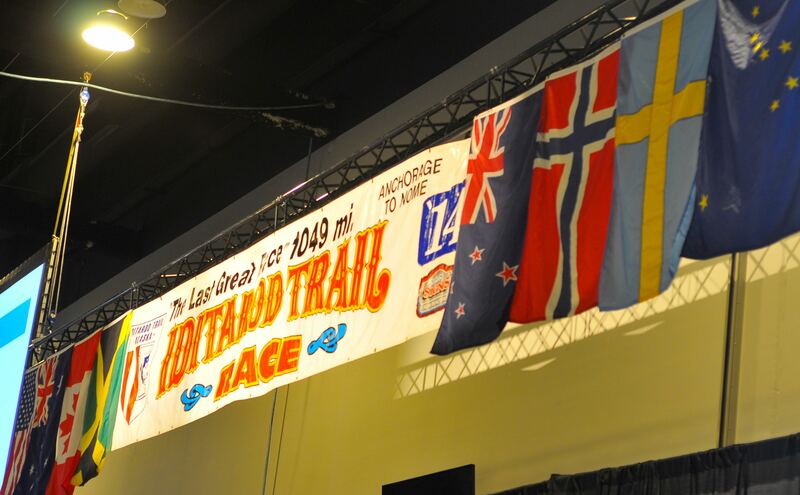 If your students completed this week’s Iditarod Trivia Tuesday, they found out there are 13 mushers from countries other than the United States signed up for the 2015 Iditarod. Converting temperatures is a quick and easy lesson aligned with the Common Core. To grab your students’ attention right off the bat, reveal tomorrow’s temperature to them in Celsius. This can easily transition into a discussion about how the U.S. uses Fahrenheit while many other countries use Celsius. This can lead directly to students discovering which countries the 13 mushers from out of the USA call home. In this lesson students will identify Iditarod mushers that are not from the United States while making real world temperature conversions such as, boiling water, freezing water, body temperature, etc. Students will also develop a week-long weather forecast for their hometown and a village on the Iditarod trail. The weather forecast must be accurate according to the weather app the students choose. While developing the forecast they must also convert the Fahrenheit temperature to Celsius. 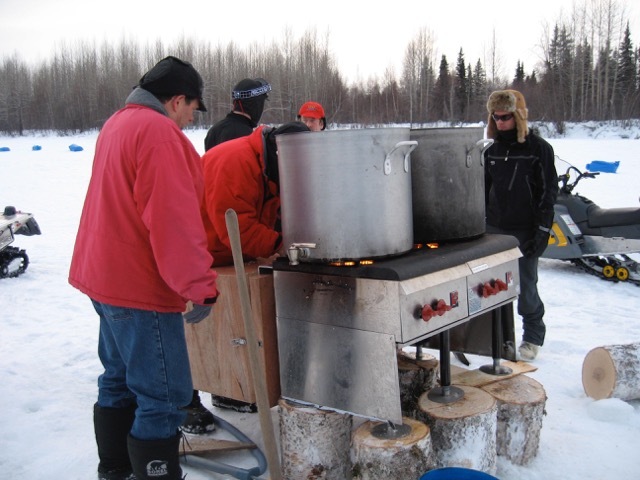 Gas stove heating water for all mushers in Skwentna. The sixth grade students at Camanche Middle School, where I teach, report the weather daily at the beginning of the day. I am going to challenge them to start reporting the temperature in Celsius. This will require reporters to convert the temperatures and encourage the listeners to convert the temperatures. Good luck converting temperatures. Several years ago, we realized that we were never getting to the Geometry Unit that inevitably occurred at the end of the math book and therefore at the end of the school year. We decided to break up the unit into pieces and teach it periodically throughout the year. Inspired by the book Mathematical Art-O- Facts: Activities to Introduce, Reinforce, or Assess Geometry & Measurement Skills by Catherine Johns Kuhns, we decided to accomplish this by using art to create monthly geometry projects. This allowed us to teach the geometry skills throughout the year in a hands-on way that require the students to use the new geometry skills immediately to create something. When I returned to my school from my Alaskan adventure, the boys were returning from Spring Break and the time was prime for a hands-on Iditarod related geometry project. We spent a week enlarging Jon Van Zyle’s print A Nod to the Past to six times the original size! We had a wonderful discussion about the piece of art, the feelings it evoked, and the Iditarod memorabilia it featured. We worked as a full class to compete the project. While each boy was responsible for completing one square of the enlargement, the nature of the project was such that they naturally checked in with each other to see if their measurements were matching up. There were wonderful discussions and coaching between boys about how they were solving the problems. When it came time to color their masterpiece, leaders naturally rose to the top as they discussed shading and combining colors to achieve the desired results. It was nice to see the artistic boys have a chance to be the leaders. The finished product in the hallway is a show stopper and visitors often stop by to admire it and ask questions! Attached is a lesson plan to explain how we completed the project. And, a lot of the data generated by the race deals with time – time on the trail, time in the checkpoints, required resting times, starting times, differential times, and so on. So we are all about time, military time, and elapsed time these days in math class. We started the week by reviewing telling time. We talked a lot about how accurate the checkers have to be in recording the in and out times of the mushers because every minute counts! I gave each student a sticky note to keep on their desk and periodically throughout the day I rang a bell and yelled out things like “Monica Zappa just checked in to Unakaleet. What time is it?” “Ken Anderson is pulling out of Safety. What time is it?” “Dallas Seavey just arrived at Shaktoolik. What time is it? He wants to stay ten minutes. What time is he leaving?” The students recorded the answers on their sticky notes and later in the day we checked their results. Meanwhile Back at School: This week we have been exploring mean, median, mode, and range. This skill have been removed from the elementary curriculum by the Common Core, but for me, it’s still a great way to review the basic operations and it’s pretty essential to understand some of the data that comes out of the Iditarod. So, this week we have been analyzing data galore. 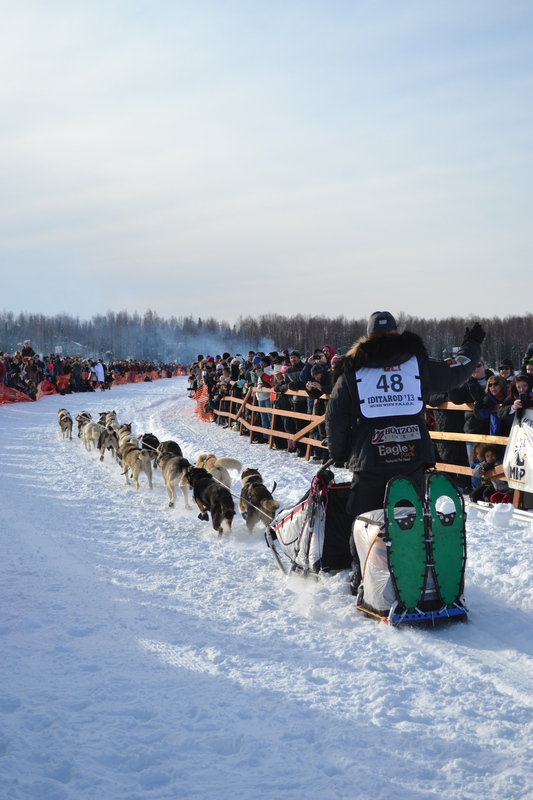 We have calculated the mean, median, mode, and range of the overall winnings of some of the top mushers, ages of the mushers, and numbers of Iditarods they have run. Attached you will find our culminating activity for this section of the unit. 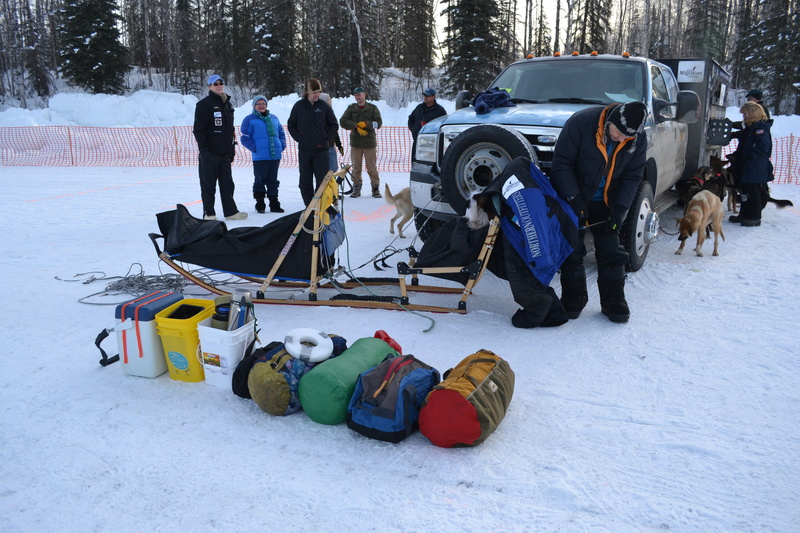 The students will determine what an “average” leg on the Iditarod is. Half of the class will find the average leg of the Northern Route, half will find the average leg on the Southern Route, and then they will compare their findings. They will then use this information to determine which route they would rather run on. My students are usually spit on this decision, but their reasoning is always fascinating to hear! We have been working really hard in math these days, so it’s time for a little fun challenge! Here are some Paw Print Sudoku puzzles for you to share with your kids! Depending on their level, you may want to draw the mini-grid lines in or have them draw them in prior to trying to solve the problems. Enjoy! The last day I was meant to be at my school there ended up being snow day! That day was also supposed to be the day of our big “Musher Banquet” so, now that the kids are back in school after their five day extra-long weekend, they finally got to have their banquet! When the day of the banquet finally arrived, the kids signed in to school on a board in the order of their arrival. This was to simulate the mushes “signing up” for the race, which in part determines their order for drawing their numbers. At the banquet, kids were seated at long “banquet” tables decorated with puppy print tablecloths and some extra copies of the centerpieces we had sent up to Alaska for the “real” musher banquet (more on that here – LINK). The boys began the festivities by belting out Hobo Jim’s “The Iditarod Trail Song” and munched on Klondike Bars and cookies shaped like dogs and sleds. When it was their turn to choose their musher, they went to the front in the order they signed up in the morning, reached their hand into the mukluk and drew out one the musher stacks from the probability experiment. 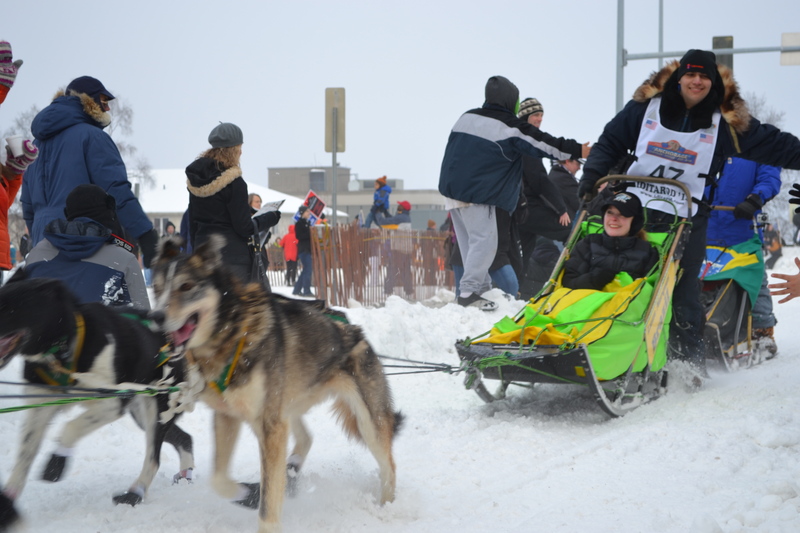 (In real life, the mushers to go the stage, reach into the mukluk and draw out a chip with a number on it. That number becomes their starting number for the race). 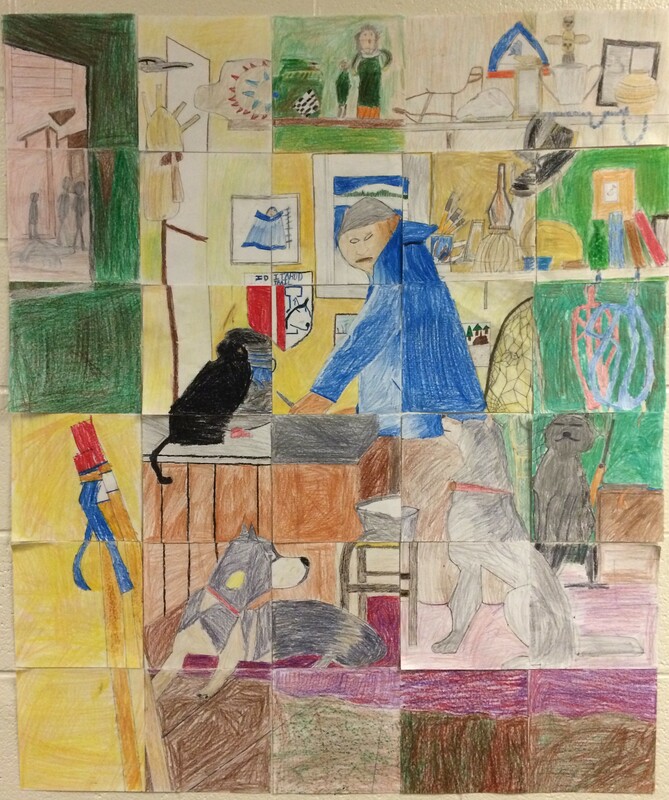 The students then had to choose a musher from the board that matched the characteristics on the stack they had drawn. Once they chose their musher, they moved through the autograph chute and autographed some posters (not quite as many as the mushers do at the banquet!) and then proceeded to pick up their race packets. (The mushers will find their dog tags and the identification tags for their handliers in their envelopes, now that they finally know their start order.) The students found biographies of their mushers, an Iditarod pencil, and a blank biography card in their packets. While the others were choosing their mushers, they got started on completing the biography card of their musher that will be displayed with their tracking map. Everything of course was photographed and filmed by the “paparazzi” from the Gilman/Anchorage Daily News and the Gilman/Nome Nugget! I was sorry I missed the banquet. By all accounts it was a huge success! The countdown is on! place, $1,049.00 will be paid to each remaining finisher. But of course the race purse isn’t the only money involved. Before the racers can even hope to get to the finish line to collect a part of the purse they will have spent thousands of dollars in preparation which provides students with lots of opportunities to practice their money skills. We always begin with a review of counting money, but for us, our new learning is making change. Here is a classwork assignment Starting Line Snacks and homework sheet Iditarod Shop page 1 Iditarod Shop page 2 to review those skills.